You can be as reckless as you want with your bottle of Moutain Dew around Stealth's new fanless WPC-525F computer. As the name implies it relies on its aluminum chassis as one large heatsink to dissipate high temperatures. So besides near silent operation, it's also sealed making it completely waterproof and dustproof. The $1,595 base configuration comes with an Intel Dual-Core D525 processor running at 1.8GHz, 4GB of DDR3 memory, and a 120GB SSD so there's basically no moving parts inside. 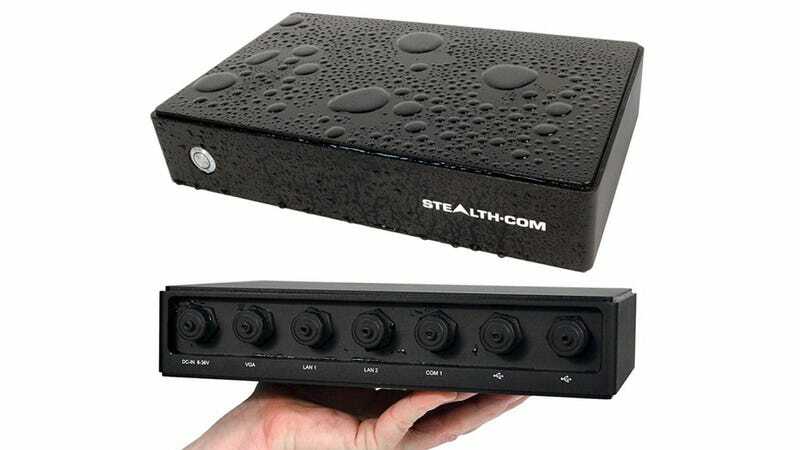 And in order to provide connectivity like USB, video, and LAN while keeping water out, the case uses watertight bayonet connections and adapter cables. So if one unfortunately wears out, they're not exactly common or easy to replace at your local computer shop.